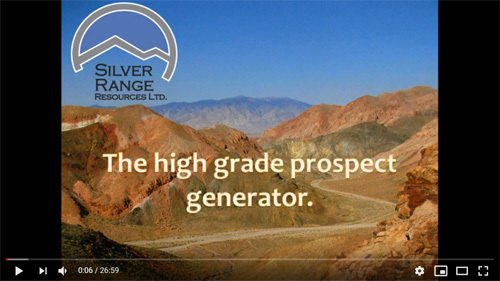 Silver Range is Exploring High Grade and Bulk Tonnage Prospects at Strongbox Property in Nevada | Silver Range Resources Ltd.
January 15, 2019 – Vancouver, BC – Silver Range Resources Ltd. (TSX-V:SNG) (“Silver Range”) is pleased to provide an update on work recently completed at its wholly owned Strongbox Property in Esmeralda County, Nevada. The Strongbox Property hosts widespread structurally controlled gold mineralization that straddles Tule Canyon, the site of two small historical hard rock mines (Dark Secret and Eastside) as well as an historical dry wash placer operation. Silver Range recently described the Strongbox Property and two other drill-ready Nevada prospects in a talk presented at the American Exploration and Mining Association annual meeting in Spokane, WA. A link to a video of this presentation, updated with recent results, can be found here. Sampling at Strongbox during October 2018 discovered new, shallow-dipping vein-hosted mineralization on the west side of Tule Canyon about 40 m west of the Dark Secret Mine. A chip sample across a hematitic clay and quartz shear returned 0.7 m @ 37.3 g/t Au. Earlier chip sampling across part of the alteration zone including workings at the Dark Secret Mine returned 20 m @ 0.923 g/t Au. (Silver Range Press Release dated January 18, 2018). On the east side of Tule Canyon grab samples of quartz vein exposed on the backs of stopes in the Eastside Mine returned from 5.38 g/t Au to 27.6 g/t Au. A chip sample of similar material underground graded 0.30 m @ 5.25 g/t Au. The known mineralization at Strongbox appears to be part of a larger structural system that is outlined by sinuous resistivity highs. The Eastside and Dark Secret Mines occur in the western part of the system, and the eastern portion occurs in an area blanketed by thin overburden. Hand trenching is currently underway, targeting mineralization in the eastern portion of the system. Samples collected at Strongbox were secured and shipped to ALS Minerals facilities in Reno, NV for sample preparation and to North Vancouver, BC for assays and geochemical analyses. Rock samples were analyzed by Ultra-Trace Aqua Regia ICP-MS (ALS code ME-MS41) and fire assayed for gold (30 g sample) (ALS code Au-AA25). Technical information in this news release has been approved by Mike Power, M.Sc., P.Geo., CPG, President and CEO of Silver Range Resources Ltd. and a Qualified Person for the purposes of National Instrument 43-101.